Some people like to do beaches for their summer vacations. We like zoos. We’ve been members at Binder Park Zoo since before L was born. We’ve always loved going to the zoo and it’s gotten even better with kids. We’ve been planning our vacations around zoo trips the last few years. 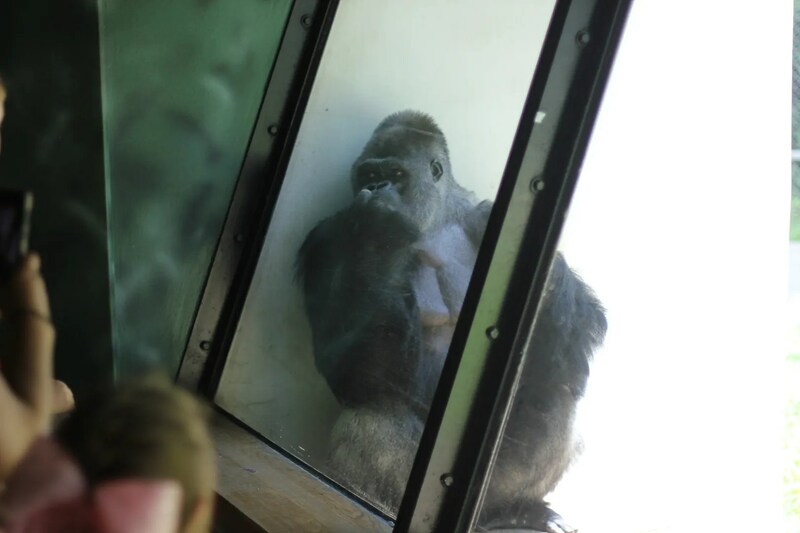 Last year, we took a trip to the Columbus Zoo. 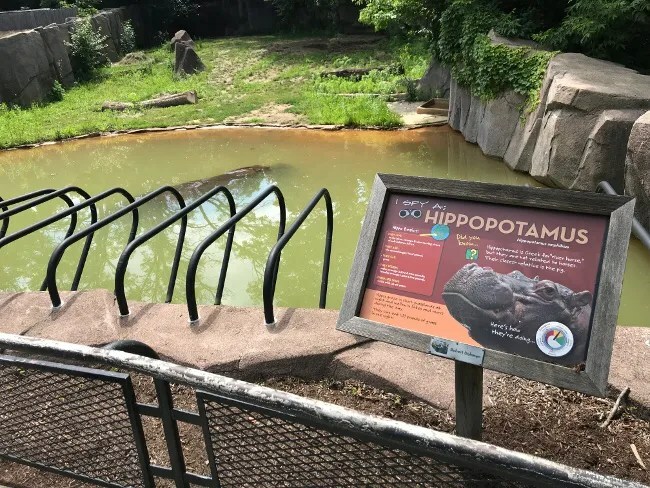 In the past we’ve done Indianapolis, Brookfield, Lincoln Park, Toledo, Detroit, and all the smaller zoos we can go for day trips. This year we took off around the Big Lake to the where the sun rises instead of sets over Lake Michigan. 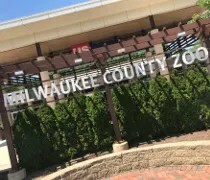 The Milwaukee County Zoo is on the west side of Milwaukee right where I-94 and I-41 meet. The zoo’s main entrance is on Bluemond Road. 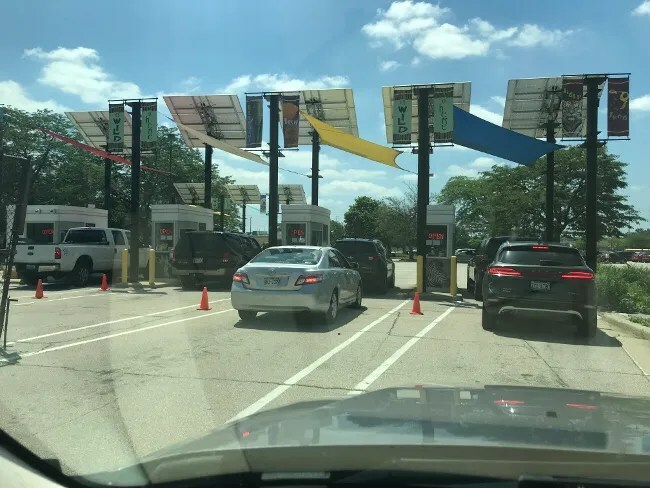 Unlike most zoos, when you enter the parking lot, you actually pay for both your parking and your admission at the same time. With our reciprocal membership, which is half off, came out to just under $35 for the four of us to get in. Parking was a cinch on a Thursday morning. We actually got a spot fairly close to the main building. 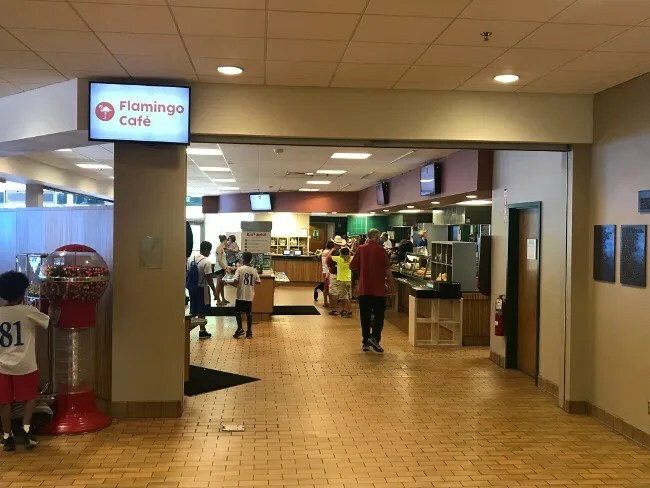 Since you pay at the entrance to the parking lot, the way you’re funneled in to the zoo is through a big building. 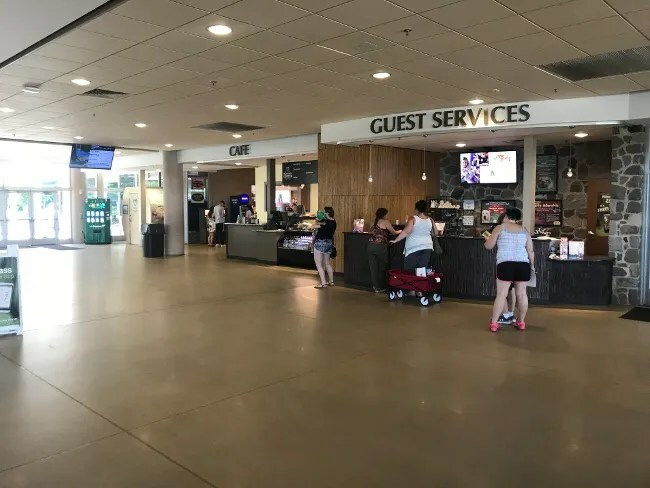 It’s also where Guests Services is located as well as zoo offices. You can get your picture taken right inside the door on a green screen for a neat souvenir. 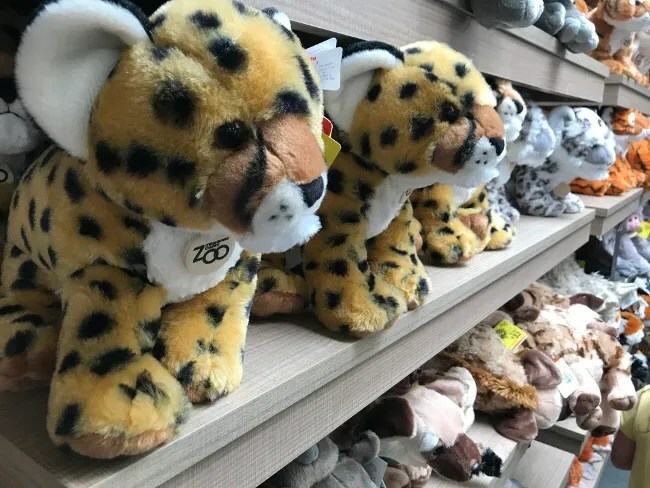 If stuffed animals are more your thing, the gift shop is also located in the building….but we’ll get to that later. 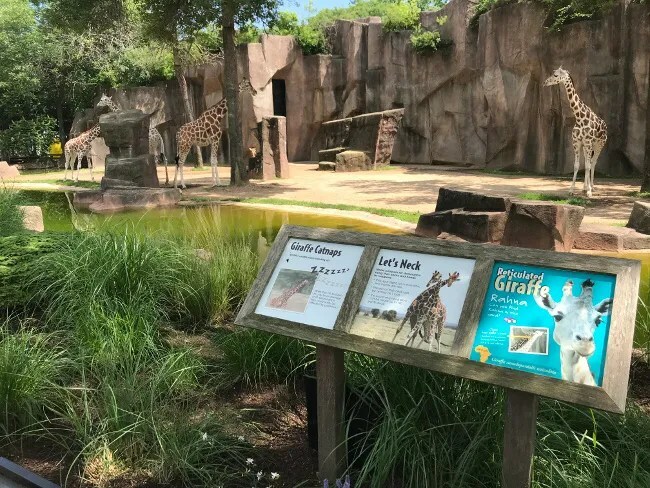 The history of zoos in Milwaukee dates back to the late 1800’s, but this site of the Milwaukee County Zoo had it’s grand opening in 1961. They’ve been adding on ever since. The original zoo was in Washington Park a little bit closer to downtown on WI-175. 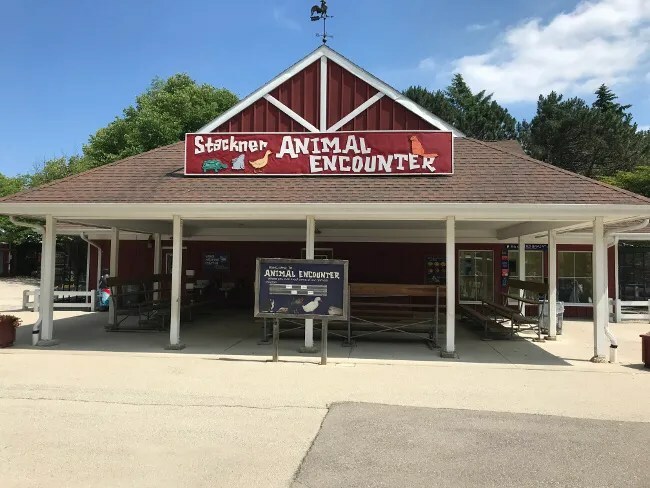 The current incarnation of the Milwaukee County Zoo is over 200 acres which is quite a big difference from the 23 acres they occupied at Washington Park. We had a funny conversation about penguins on the way to Milwaukee. L didn’t want to watch Penguins of Madagascar on the drive from Chicago because she said they were creepy..who thinks penguins are creepy? !…so it’s funny that the very first exhibit we came to was the Taylor Family Humboldt Penguins habitat. 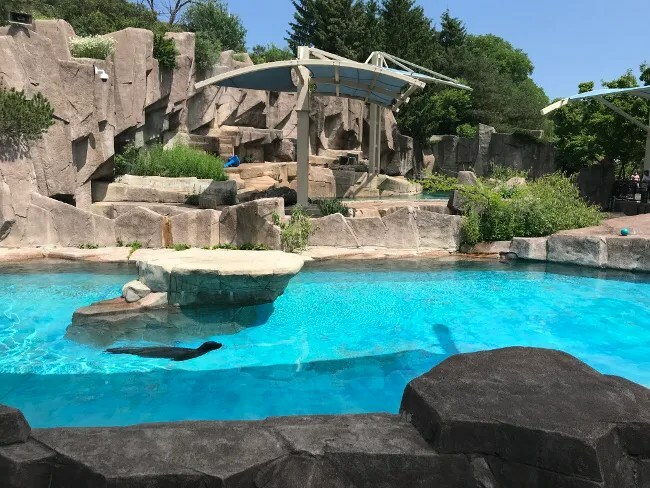 There’s a huge 15,000 square foot tank with Humboldt Penguins. The penguins get almost within arms reach of the walkway so you get a really great up close encounter with them. 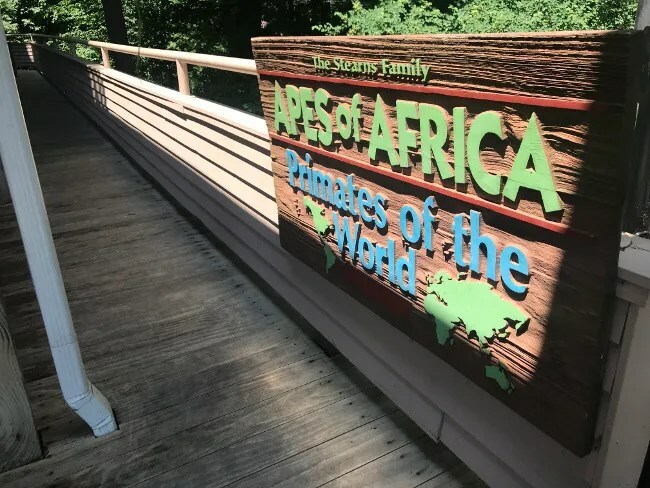 The next stop for us was the Sterns Family Apes of Africa and Primates of the World. This is both an indoor and outdoor exhibit area. It was a scorcher the day we were in town so most of the primates were indoors. We didn’t really see a whole lot at first. The pavilion is gorgeous and most importantly on a hot day, air conditioned. The first few exhibit areas were closed because they were being cleaned so we moved through pretty quickly. The animals all have a fairly big habitat both indoors and out. 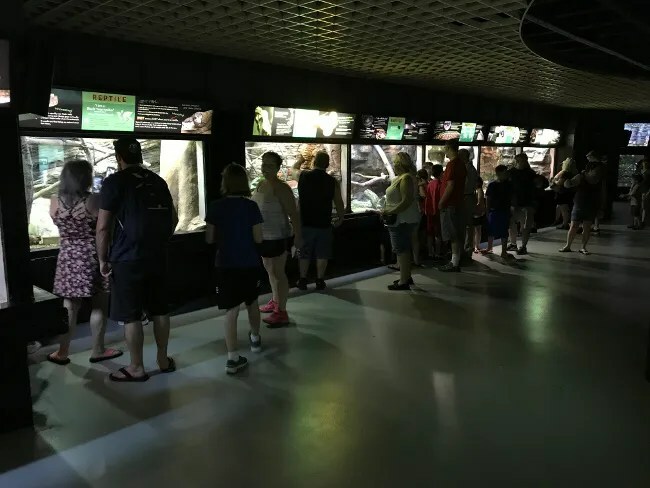 From the viewing area, there are panels with information on the species and where it’s found in the world. 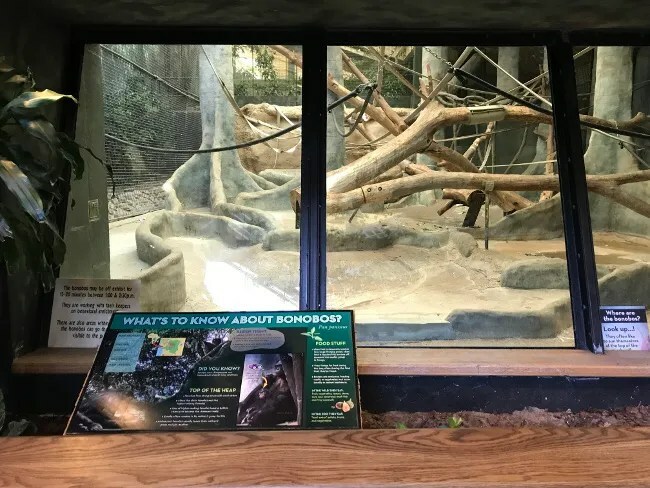 Most of the bonobos and orangutans were outside or chilling and hiding behind trees in the exhibit. The exhibit that caught my attention was right where the Primates of the World meets the Apes of Africa. The Temple Monkeys of Tikal is a cool exhibit of spider monkey’s. It looked to me like a Legend of the Hidden Temple set. Before we got into the Apes, I found one of my favorite things from zoo trips of my childhood in Chicago. 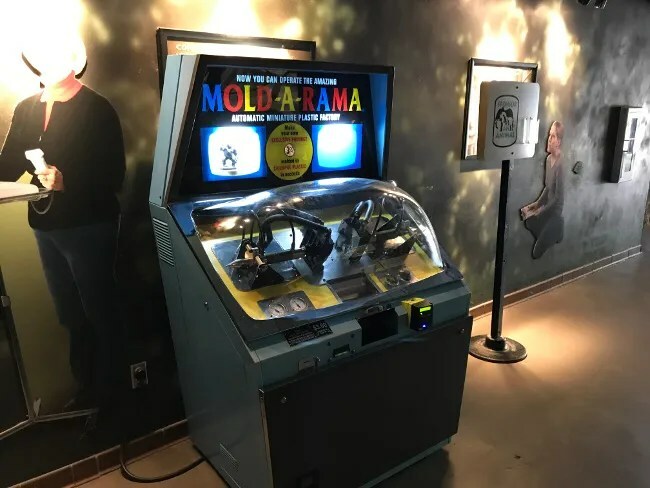 The Mold-O-Rama machine. I love this things. For three bucks, the machine spits out a piping hot plastic injection mold of one of the zoo’s animals. 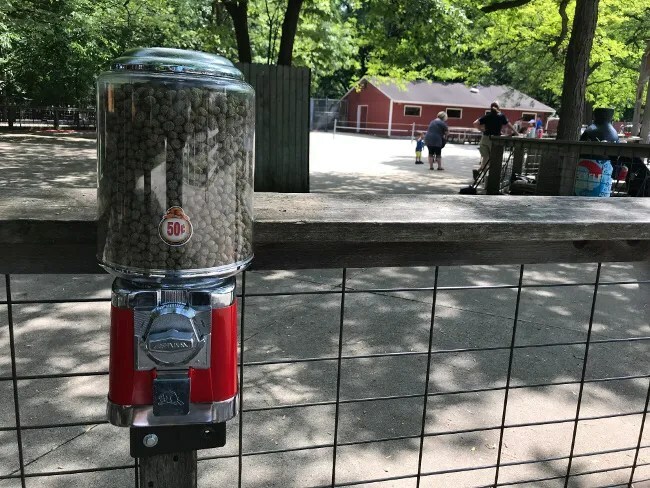 Just for kicks, here’s an awesome article about how these machines are being kept alive in zoos across the country. The Apes of Africa turned out to be a really cool exhibit. 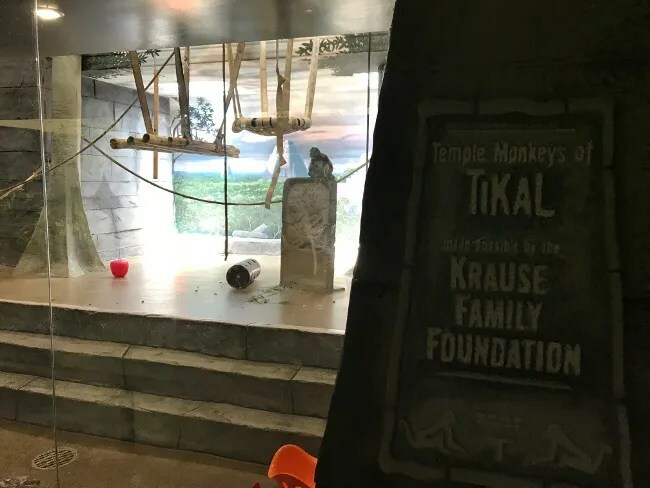 At first, we didn’t really see much then all of a sudden, one of the apes came up to the window and starting pointing at the kids. It interacted with them for a little bit then went and sat in a corner by the window. 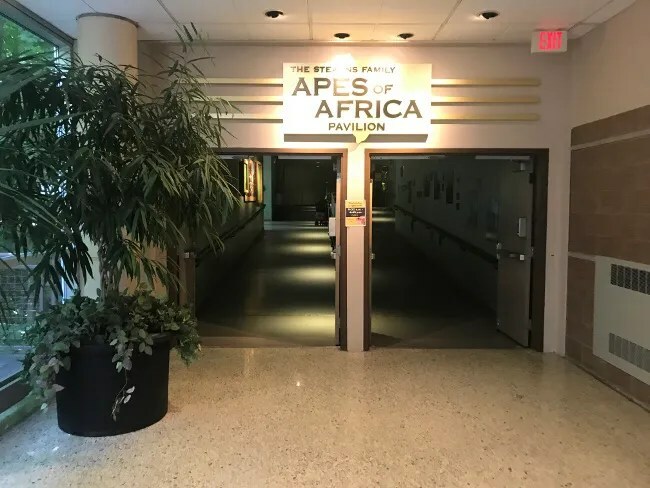 The Apes at the Milwaukee Zoo have a little bit of a history. There was a pretty famous Ape named Samson who lived at the zoo from 1950 to 1981 when he died. Unfortunately, he was famous because he was a little overweight…and even made the Guiness Book of World Records at one point. His bones are now on display at the Milwaukee Public Museum. Once we left the Apes of Africa, we found our way to the Aquatic and Reptile Center. This one is completely indoors and air conditioned. 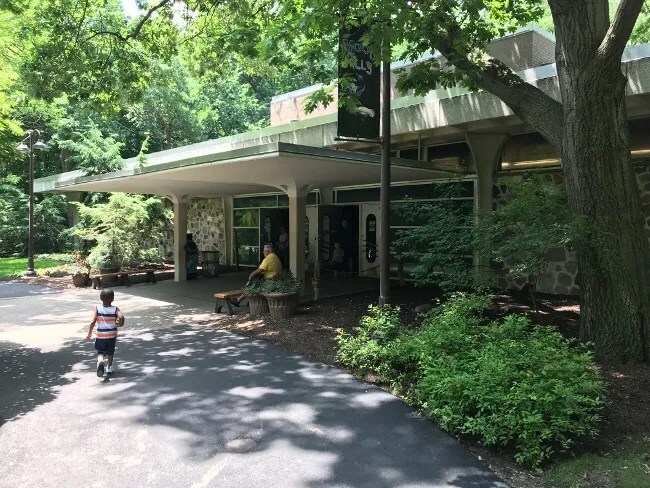 This building, built in 1968, is home to hundreds or reptiles, amphibians, fish, and other sea life. The oldest resident of the Milwaukee zoo, an Amazon River Turtle who they believe is around 100 years old, can be found in this building. 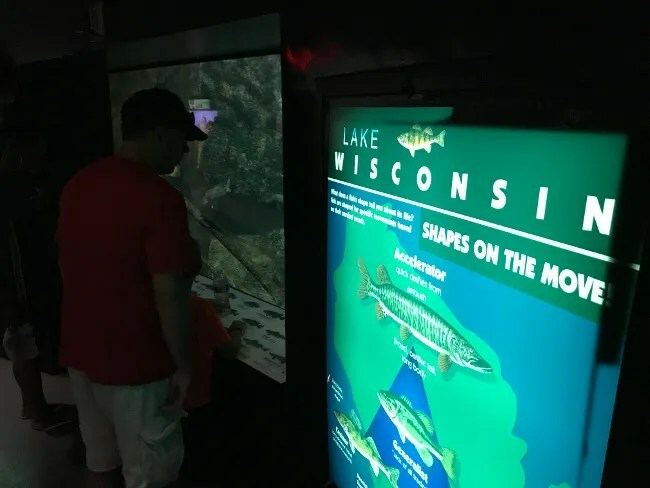 There’s also about thirty different species of fish that can be found in Wisconsin’s waterways. One of the things I really liked about the Milwaukee Zoo was the wide paths between exhibits and buildings. 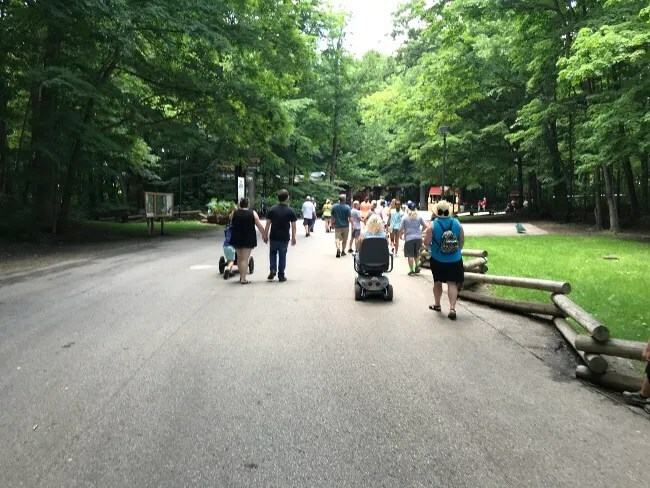 The zoo wasn’t very crowded when we were there, but even on busy days, the walkway’s are wide enough to move comfortably between different areas of the park. The paths are also clearly marked at all the intersections. 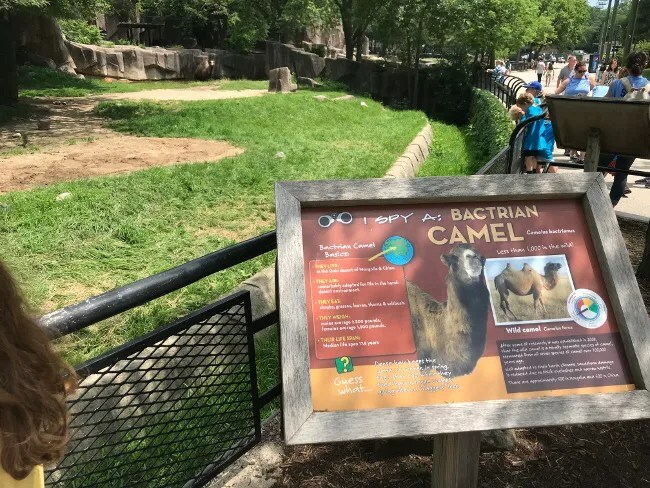 I found the zoo a little difficult to navigate because there’s not a clearly defined path that will hit all of the exhibits. 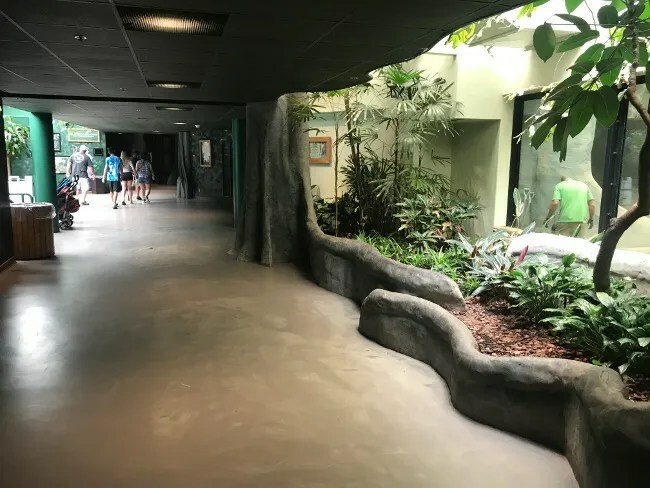 I really liked the Columbus Zoo’s layout with a main path going around the zoo that branched off into loops at the different areas that always brought you back to the main path. 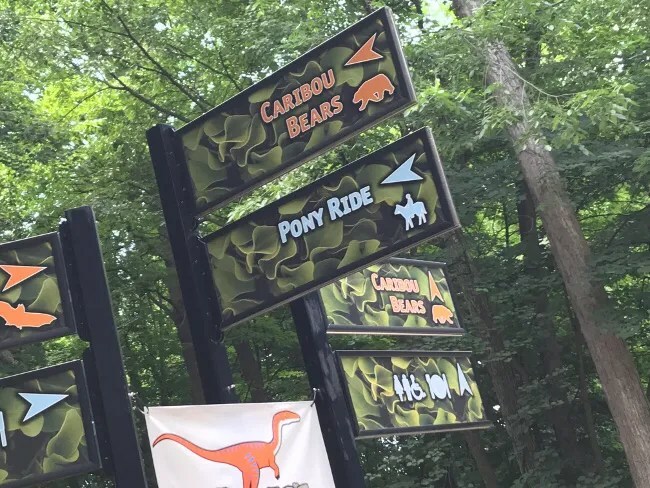 We actually missed the Dinosaurs, small mammals, and otters because I don’t know how to read a map and we didn’t want to backtrack. We missed those exhibits because we really needed to find lunch. I thought I was heading towards one of the cafe’s when I actually took the wrong turn and cut across on the path that skips those animals. Unfortunately, the cafe we came to is only opened on weekends. 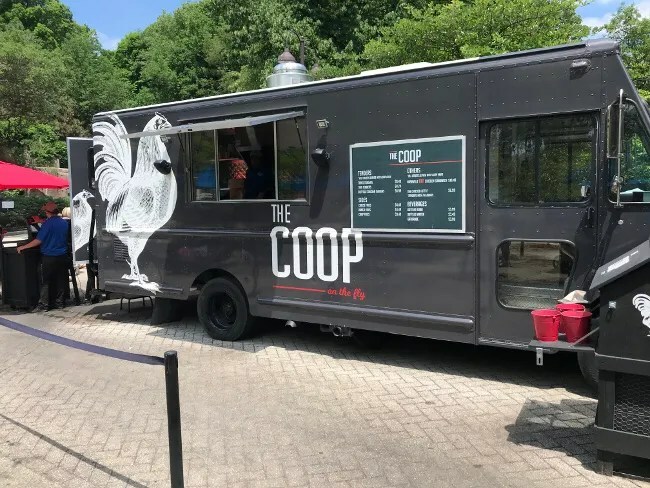 Fortunately, they have a food truck serving up Nashville Hot Chicken right in front of the closed cafe….but we’ll get to that in a separate post. We got some food in the kids’ bellies which made them a little bit happier. The morning had been a little bit of a struggle after a long drive and battling the heat. The big one wanted to ride in the stroller and the little one didn’t. We needed that to be opposite. To keep the happy going, we walked back to the pony rides. 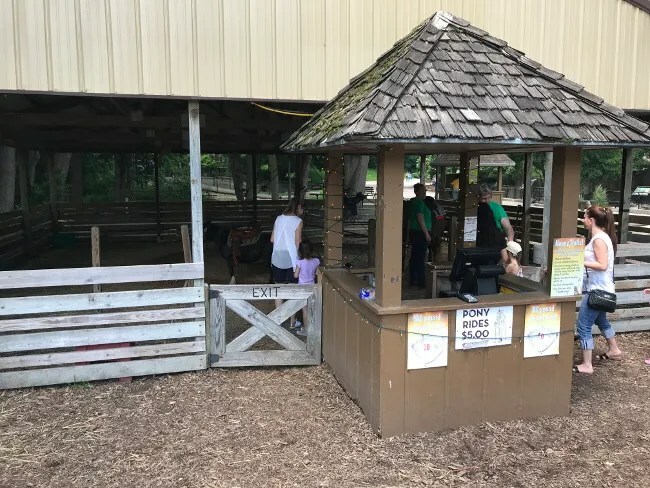 The kids had so much fun on the pony ride at the Ft. Wayne Zoo so I was happy to pay the five bucks so each of them could ride a pony. This one is run by an outside amusement contractor. They set the ponies up to walk in a circle. L was big enough to ride by herself. B probably would have been alright but I walked alongside him just in case. Both kids has smiles on their faces the entire time. Alright, so time to get back on track. I actually thought I was walking back towards the North American Exhibit but the furthest we got was the Black Bears. Again, bad map reading and a cut through road that took us off the main track caused us to miss a few things. We picked our tour back up in the loop that has a combination of South American, Asian, and African animals. The camels were up first….and you know it’s hot when the camels are playing in the water. 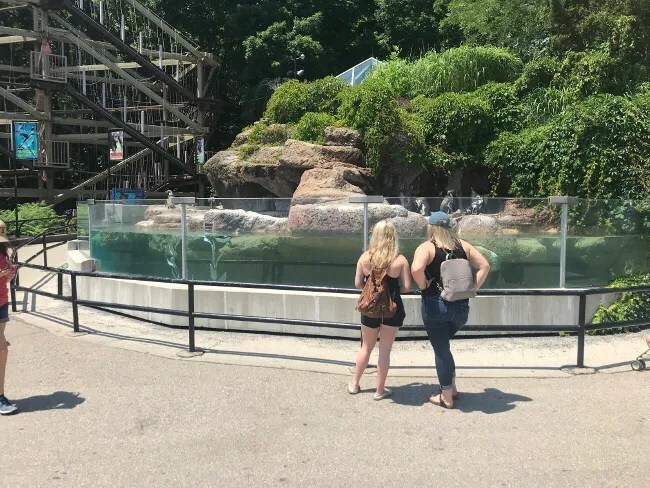 We did make a little bit of a loop back around after getting Icees to the pools were the polar bears and harbor seals are at. The polar bear was nowhere to be found. There was one seal swimming in the pool but there wasn’t much going on in this huge pool. We went back to the trail where the giraffe’s were at. 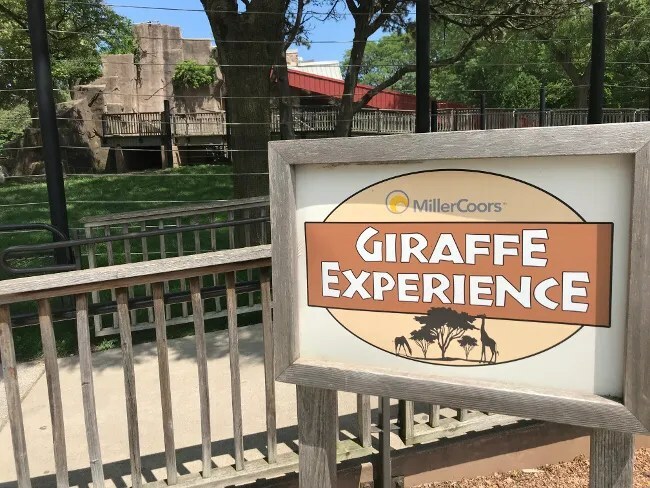 There is a “Giraffe Experience” feeding twice a day but tickets were already sold out. I say this at every big zoo we go to, no one can compare to Binder Park Zoo‘s giraffe feeding experience. Everyone gets to do it and there’s not pre-purchased tickets. We were about right in the middle of the morning and afternoon feedings and the tickets were sold out anyway. There is a pretty great viewing area though. The giraffe’s are pretty close to the walkway and essentially only separated by a small pool. The giraffe’s were all eating from the trees when we walked by and there were even a couple babies roaming around. B was most looking forward to the big cats so we went looking for them next. The exhibit was kind of confusing at first because you walk down this long covered path with cages on the side but nothing in them. 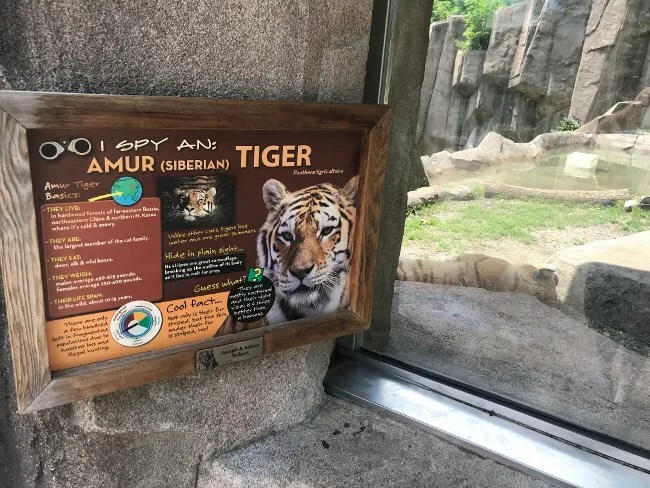 We got back to an open area where we found the Amur Tiger sleeping next to the glass. B was super excited but wanted to see it move. We told him we don’t disturb animals while they’re sleeping so he got back in the stroller and we moved on. 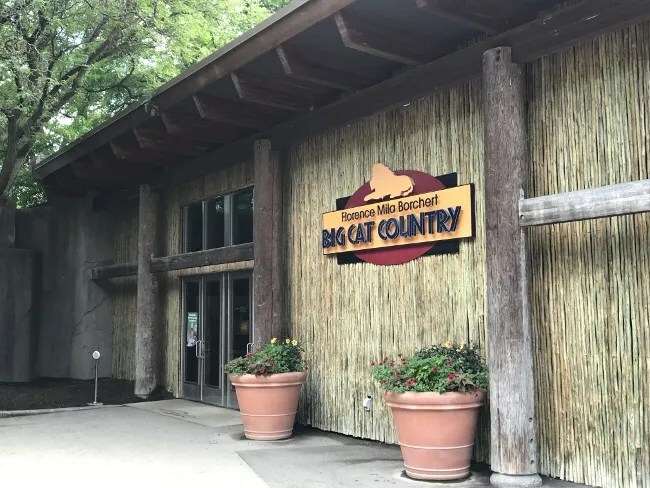 Then we found the indoor exhibit called Big Cat Country and things were much different. The tigers inside were up and very playful. 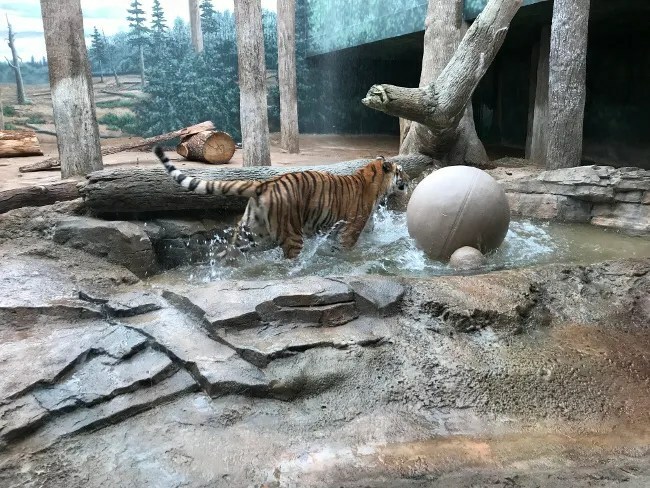 One of them was splashing in a pool near the viewing glass and playing with a giant ball. B screeched with delight the whole time until we finally pulled him away from the window so others could see. He’d also been asking to see a lion so you can guess how excited he was when we came across the two females just chilling on some rocks in their exhibit. We found the male a little later outside but he was taking a nap in the hot, afternoon sun. Both kids were starting to lose steam but we still hadn’t seen the elephants. We started heading that way when I came across this hippo…just chillin’ in the water. We hung out for a while to see if she’d come up for air. Eventually, the nose rose out of the water just a few inches then went back down. We had actually prepared B to not see elephants on this trip. I forgot to look before we left and I know elephants at zoos are getting rarer and rarer. 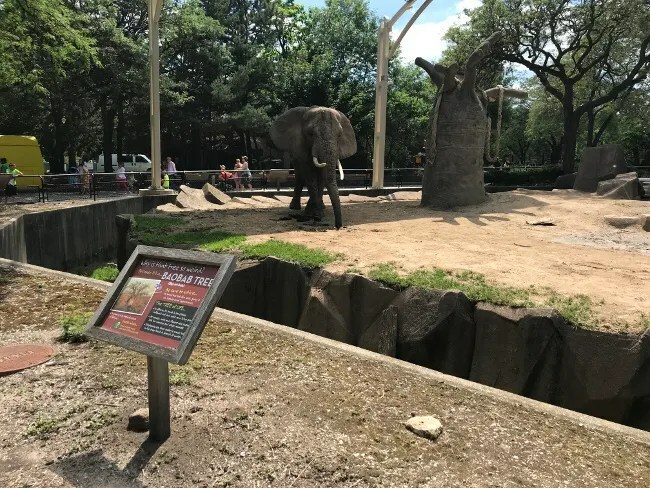 The Milwaukee County Zoo had several and like a lot of their exhibits, there was only a small barrier between the walkway and the exhibit and a lot of the elephants were getting up close to find food. Now that we had seen the elephants, we were on the home stretch. We headed towards the Northwestern Mutual Family Farm. 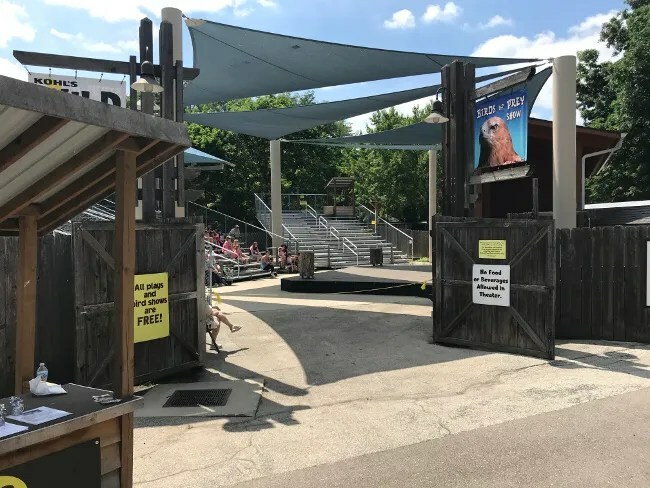 Right inside the gate is a Birds of Prey show that going on. As we were walking in, a Macaw from the show flew right by my head on it’s way back to it’s trainer. There was an animal encounter..but like so many other things, they were timed and we weren’t there close to one so we kept walking. 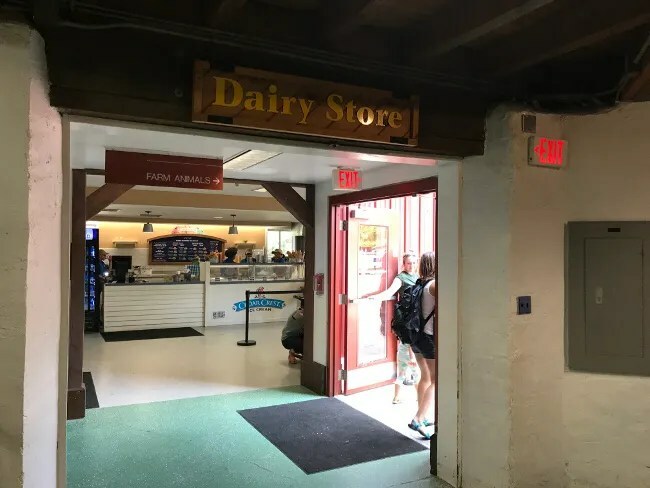 And that brought us to the Dairy Complex. This is an important educational area inside the children’s zoo. 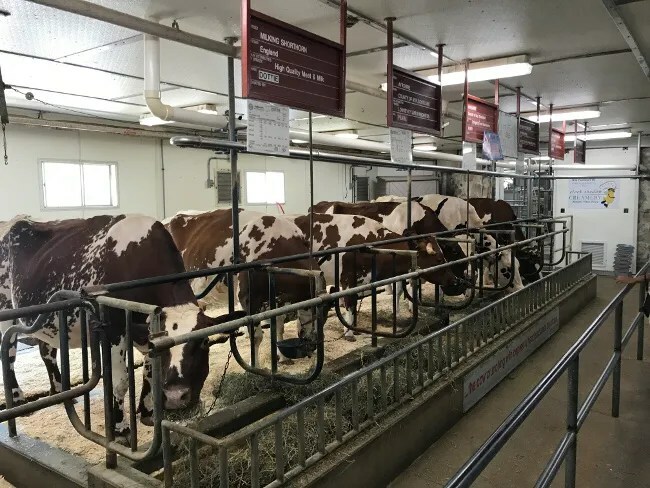 There are cows inside the barn that are actually milked and you can watch them do it if you’re there at the right time of day. We had started to get a little worried because we kept promising B goats..his favorite part of any zoo, but we hadn’t seen them yet. Once we got through the Dairy Complex, I finally saw the sign for the Goat Yard. The kids had such a blast, as they usually do, petting the goats. 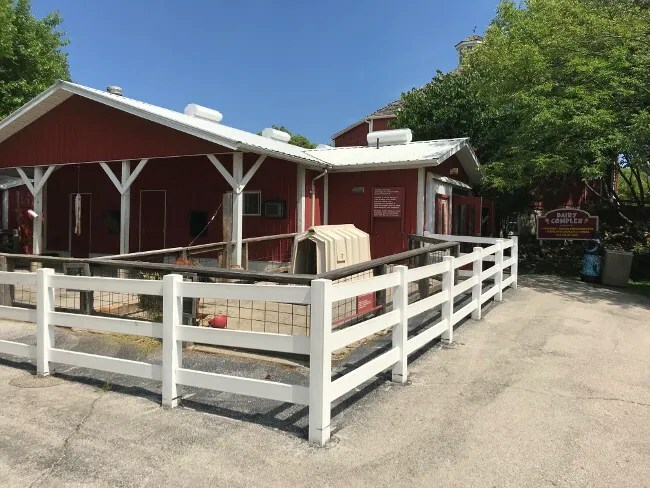 The thing we loved about this goat exhibit is you could actually feed the goats *inside* the pen. 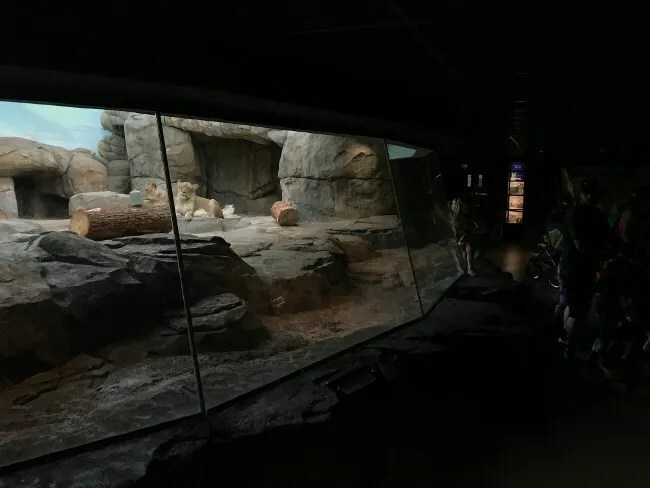 Most zoos make you feed from the outside. J went out and got a couple of handfuls of food and we portioned it out to the kids. When we ran out, B started apologizing to the goats. I told him I’d go get more and he looked a goat right in the eye and said, “I’m sorry. 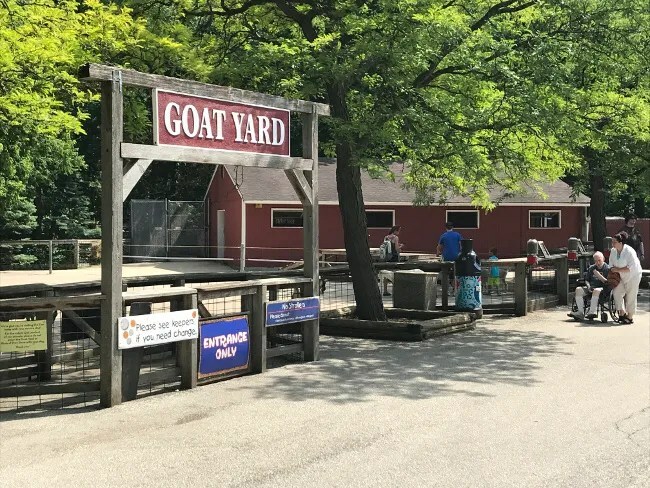 I’m all out, but my dad is getting more.” It was the most hilarious, cutest thing he’s said to a goat since yelling, “I’m gonna touch that goat” as he ran towards one at Binder Park Zoo earlier this year. Once the food ran out, we started to head back towards the entrance. We retraced our steps a little bit because there is also a playground in the farm area. I hate that so, so much. The kids want to play for two hours and that’s not why we’re there. It doesn’t matter how crappy the playground is, that’s all they want to do. We started heading towards the entrance when we came upon the carousel. 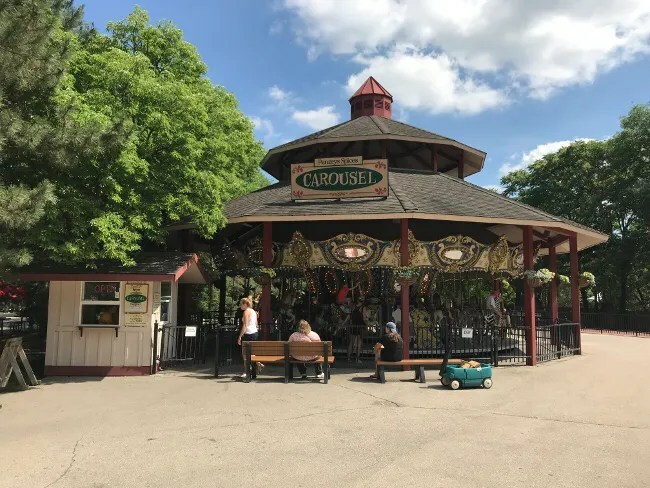 Like all the good ones, this carousel is from around 1900. It was three bucks each for the kids to ride. L is tall enough to ride on her own but I rode along with B. Just like with the pony rides, their faces light up and this one is a little fast too. One last stop before we called it a day. 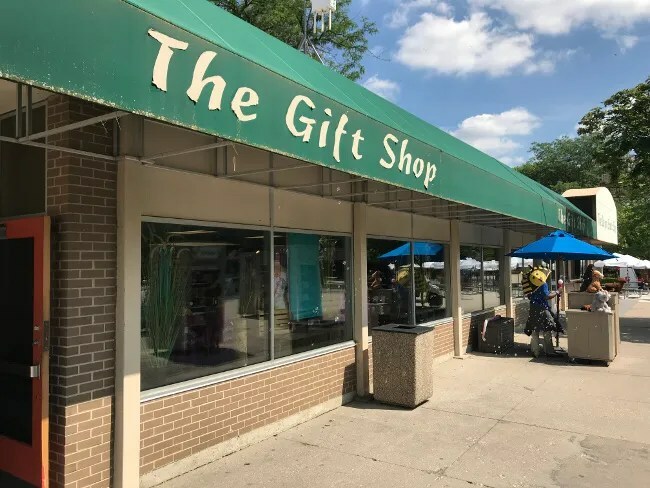 The gift shop. Nana and Grandpa gave each kid $10 to get a stuffed animal. There are kiosks throughout the zoo and there’s actually two gift shops in the entrance building. We went to the one that was on our way back from the carousel. L picked a lion out right away while B picked….candy. We grabbed the candy and pointed him back to the stuffed animals. He eventually grabbed a lemur and he hasn’t let go of it since we bought it. I’d say this is another successful zoo trip. It was such a hot day and the kids were mostly good. I had some layout issues but that wouldn’t have been an issue if I could read a dang map. GPS has screwed me. 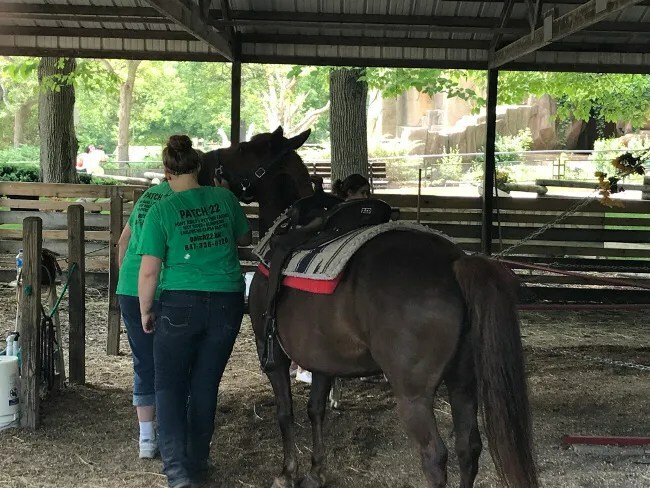 We saw a lot of great animals up close and the kids had a blast. I think they got to see everything they wanted to see. 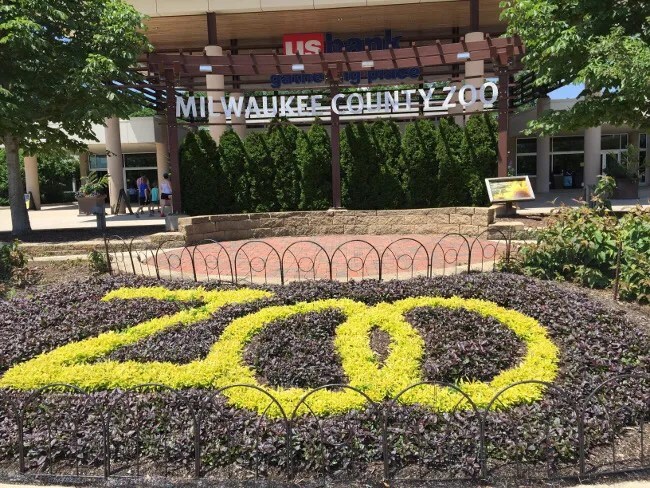 The Milwaukee County Zoo is another great one within an easy driving distance from Southwest Michigan. There’s so many other things to do in the city so it’s definitely worth considering the next time you’re looking for a road trip.